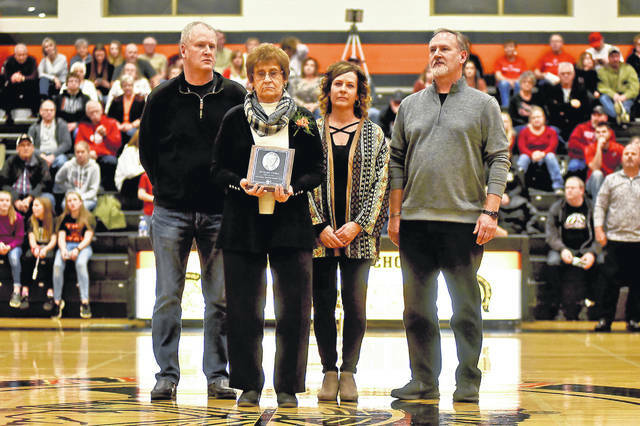 Three new members were inducted to the Arcanum Hall of Fame on Saturday. Seated from left to right are John Stephens, Virginia O’Dell (representing her late husband Richard) and Shawn Hein. 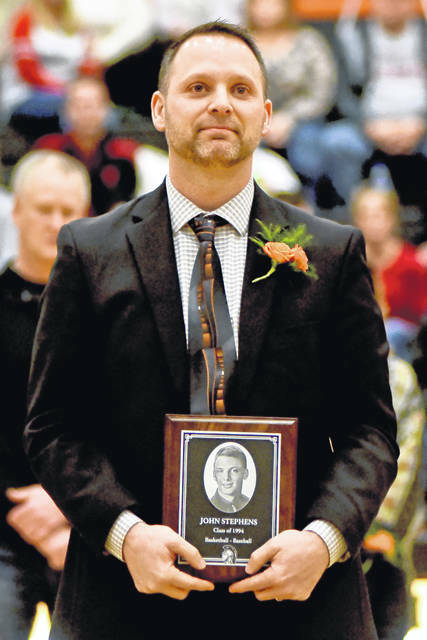 John Stephens is one of three new members in the Arcanum Hall of Fame. The late Richard O’Dell, who is represented here by his wife Virginia, is one of three new members in the Arcanum Hall of Fame. 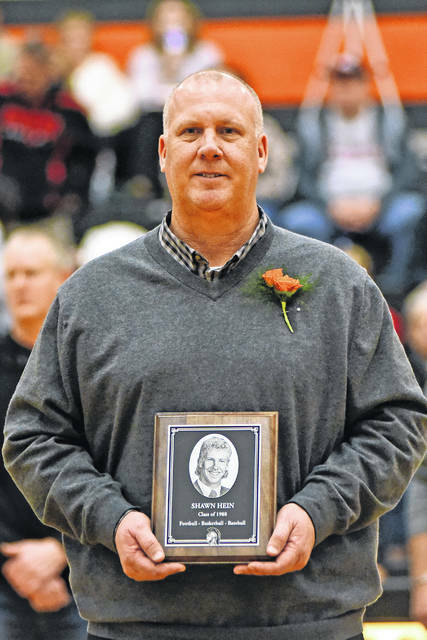 Shawn Hein is one of three new members in the Arcanum Hall of Fame. 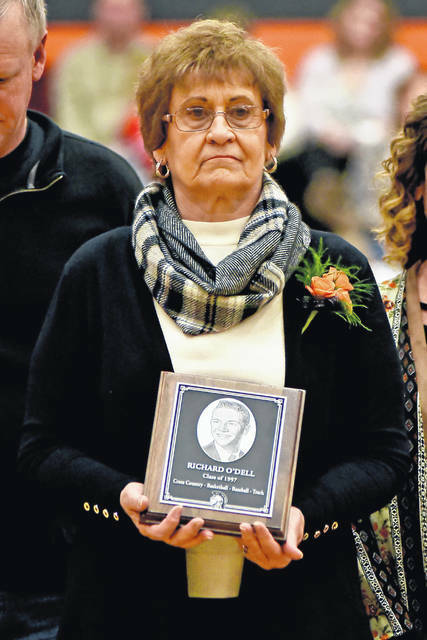 The late Richard O’Dell was represented at the Arcanum Hall of Fame inductions by his family including his wife Virginia and children Kevin and Randy O’Dell and Missy Pohl. 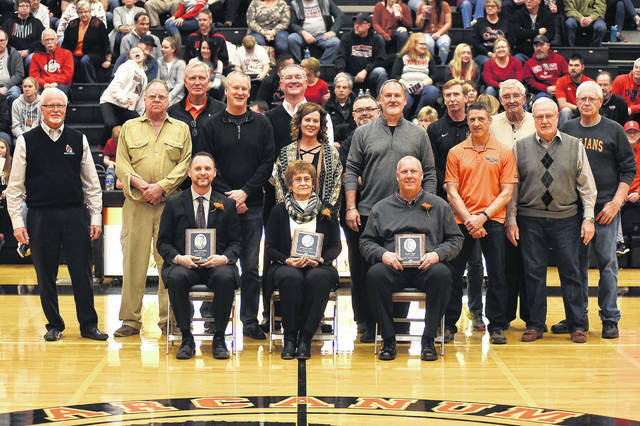 The three new members of the Arcanum Hall of Fame, seated in the front from left to right John Stephens, Virginia O’Dell (representing her late husband Richard) and Shawn Hein, are joined in a group photo by other members of the Hall of Fame. 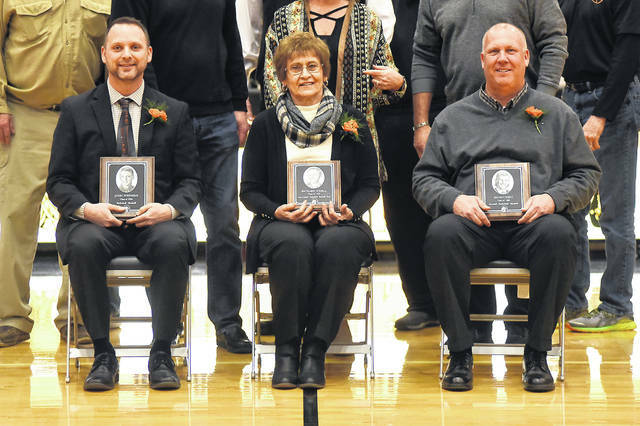 ARCANUM – Arcanum-Butler Schools inducted three new members into its Hall of Fame Saturday night. New members were Shawn Hein, Richard O’Dell and John Stephens. Shawn Hein was a 1988 graduate earning 8 varsity letters participating in Football 1984-87. The team won the Cross County Conference league titles each year and appeared in the football playoffs and was regional runner-up. He was named first team All-CCC his junior and senior year, was district first team on offense his senior year and was special mention All-State. Upon graduation he held the majority of all passing records for a single season and career. He currently holds the record for punting average. Shawn was also a standout on the basketball court receiving three varsity letters and was named to the District 9 All-Star team his senior year. He was part of a team that won the league title and they were also district runner-up. He scored over 900 career points and had over 300 rebounds. In baseball, Shawn received two varsity letters. They won two league titles and two district titles. Shawn continued his education at the University of Findlay where he majored in Health & Physical Education – Recreation Management. He received his Master’s in Education and Leadership from Marygrove College. He and his wife Beth reside in Arcanum with their daughters Emma and Claire. He is currently a health and physical education teacher for the Arcanum-Butler Local School District. Richard O’Dell was born April 11, 1939, in Verona, Ohio. He attended Butler School and graduated from Arcanum High School in 1957. He participated in basketball four years, baseball two years, cross country and track. He was class president and also participated in FFA. He was the starting forward on the 1956 state championship team under the coaching of Glenn Harter. Richard married his high school sweetheart Virginia Lephart in 1957. They had three children: Kevin and Randy O’Dell and Missy Pohl. In 1974 Richard and Virginia purchased Brown’s Service Store in Arcanum and later changed the name to O’Dell and Sons Service Store. Richard was an avid supporter of many community and school teams and functions. Richard was very active in his community. He coached Little League baseball for many years, coaching his two sons, Kevin and Randy. In 1978 Richard, along with a few other community members, formed a committee to construct our current community ballpark. Unfortunately, Richard passed away at the young age of 43 in 1982. Representing Richard were his wife Virginia, and children, Kevin, Randy and Missy. John Stephens is a 1994 graduate of Arcanum High School. As an athlete, he was a member of the basketball and baseball teams. John was a two-year varsity basketball letterman. He averaged 20 points per game as a guard his senior year. His career-high points scored was 39 against Bethel during the 1993-94 season. His honors were many his senior year being named to the All-CCC first team, All-Southwest District special mention, and named to the All-Darke County Team. He and his teammates were the 1993 district runners-up having won 14 straight games. John held the 3-point season record until it was recently tied by Carter Gray, who is a member of this year’s basketball team. John also received four varsity baseball letters. In 1994 he was named second team All-State and All-CCC first team. He and his teammates were regional runners-up in 1994. They were ranked fourth in the state during the season. The 1994 team currently holds the school record for stolen bases and triples in a season. John attended Bluffton University where he played basketball one year and baseball for four years. He was named Defensive Player of the Year in 1996. He was the team leader in doubles and second in RBI’s in 1998. Upon graduation, John was ranked in the top 10 in career assists and doubles in a season. John, his wife Mary and their sons Luke and Drew reside just west of Ithaca. He received his BA in Elementary Education from Bluffton University in 1998 and his Master of Science in Education and Allied Professionals from the University of Dayton in 2002. He began teaching at Vandalia-Butler Schools and returned to his alma mater as the elementary principal in 2006. He has served as the Superintendent of the Arcanum-Butler Local Schools since 2012.